The Doctors' trial (officially United States of America v. Karl Brandt, et al.) was the first of 12 trials for war crimes of German doctors that the United States authorities held in their occupation zone in Nuremberg, Germany, after the end of World War II. These trials were held before US military courts, not before the International Military Tribunal, but took place in the same rooms at the Palace of Justice. The trials are collectively known as the "Subsequent Nuremberg Trials", formally the "Trials of War Criminals before the Nuremberg Military Tribunals" (NMT). Twenty of the twenty-three defendants were medical doctors (Viktor Brack, Rudolf Brandt, and Wolfram Sievers were Nazi officials), and were accused of having been involved in Nazi human experimentation and mass murder under the guise of euthanasia. Josef Mengele, one of the leading Nazi doctors, had evaded capture. Oberführer (Senior Colonel) in the SS and Sturmbannführer (Major) in the Waffen SS; and Chief Administrative Officer in the Chancellery of the Führer of the NSDAP (Oberdienstleiter, Kanzlei des Führers der NSDAP) I G G G Death, executed 2 June 1948. Personal physician to Adolf Hitler; Gruppenführer in the SS and Generalleutnant (Lieutenant General) in the Waffen SS; Reich Commissioner for Health and Sanitation (Reichskommissar für Sanitäts und Gesundheitswesen); and member of the Reich Research Council (Reichsforschungsrat) I G G G Death, executed 2 June 1948. Standartenführer (Colonel); in the Allgemeine SS; Personal Administrative Officer to Reichsführer-SS Himmler (Persönlicher Referent von Himmler); and Ministerial Counselor and Chief of the Ministerial Office in the Reich Ministry of the Interior I G G G Death, executed 2 June 1948. Gruppenführer in the SS and Generalleutnant (Lieutenant General) in the Waffen SS; personal physician to Reichsfuehrer-SS Himmler; Chief Surgeon of the Staff of the Reich Physician SS and Police (Oberster Kliniker, Reichsarzt SS und Polizei); and President of the German Red Cross I G G G Death, executed 2 June 1948. Hauptsturmführer (Captain) in the Waffen SS; and Chief Doctor of the Buchenwald concentration camp I G G G Death, executed 2 June 1948. Oberführer (Senior Colonel) in the Waffen SS; Chief Hygienist of the Reich Physician SS and Police (Oberster Hygieniker, Reichsarzt SS und Polizei); and Chief of the Hygienic Institute of the Waffen SS (Chef des Hygienischen Institutes der Waffen SS) I G G G Death, executed 2 June 1948. Standartenführer (Colonel) in the SS; Reich Manager of the Ahnenerbe Society and Director of its Institute for Military Scientific Research (Institut für Wehrwissenschaftliche Zweckforschung); and Deputy Chairman of the Managing Board of Directors of the Reich Research Council I G G G Death, executed 2 June 1948. All of the criminals sentenced to death were hanged on 2 June 1948 in Landsberg prison, Bavaria. Heller, Kevin Jon (2011). 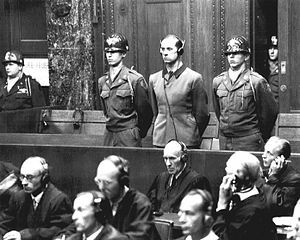 The Nuremberg Military Tribunals and the Origins of International Criminal Law. Oxford University Press. ISBN 978-0-19-955431-7. Lifton-Robert, Robert J. (2000) [1st. Pub. 1986 London:Macmillan]. The Nazi Doctors: Medical Killing and the Psychology of Genocide. Basic Books. ISBN 978-0-465-04905-9. Spitz, Vivien (2005). Doctors from Hell. Sentient Publications. ISBN 978-1-59181-032-2. Weindling, P.J. (2005). Nazi Medicine and the Nuremberg Trials: From Medical War Crimes to Informed Consent. Palgrave Macmillan. ISBN 978-1-4039-3911-1. Wikimedia Commons has media related to Doctors' Trial. Biddiss, M (June 1997). "Disease and dictatorship: the case of Hitler's Reich" (pdf). United States National Library of Medicine. 90 (6): 342–346. PMC 1296317. PMID 9227388.